Benefits of Sea Salt: How Does It Differ from Table Salt? Home » Food and Nutrition » Health Benefits of Sea Salt: How Does It Differ from Table Salt? Health Benefits of Sea Salt: How Does It Differ from Table Salt? By now, we have heard sea salt is better for us than table salt. With all of the various types of sea salt on the market, how are we to know which one to choose, and is there a difference from regular salt? Let’s examine the benefits of sea salt, which type to buy, and learn why it is a more positive health choice. Salt processing has been around for more than 8,000 years and has many uses other than flavoring food. In fact, less than 10% of salt used today is intended for food, as it is also a staple for manufacturing, agriculture, thawing ice, and water purification. Sea salt benefits extend beyond avoiding harmful additives often found in table salt. It offers healing properties and is enriched with nutrients and trace minerals for healthy skin cells. Sea salt also balances fluids, supplies electrolytes, supports digestive and nervous system health, and helps prevent dehydration. The benefits of sea salt on the skin have long been known and taken advantage of for centuries. The magnesium component found in Dead Sea salt has been proven to help with inflammation. Sea salt helps hydrate and restore your skin cells by eliminating dry, rough skin, and removes toxins from the pores. It also promotes blood circulation. Removing toxins is just one of the ways you can use sea salt for your skin. It provides a total exfoliation experience as it removes dead skin cells, tightens the skin tissue, and promotes skin rejuvenation. The rough texture of sea salt also creates a better environment for exfoliation. By improving blood circulation, sea salt is also beneficial to those suffering from fatigue, low blood pressure, and circulation problems. Sea salt benefits for acne are the result of the deep cleansing action of its sulfur content. It is used to help treat and prevent acne scars and other skin conditions. Sea salt benefits for hair health include promoting growth by strengthening the hair follicles. You can try improving blood circulation in the scalp with a sea salt head massage. As a surprise to some, sea salt contains the same fluoride we depend on to promote good dental health. It can help prevent cavities and provides a barrier against acidic damage. Enjoy this natural protector by gargling with sea salt and warm water regularly. It may also help heal mouth sores, sore throats, and irritated gums. The high magnesium content in sea salt helps relax tense and overworked muscles. Soak your feet in a bath of warm water and sea salt to alleviate swelling, pain, and tenderness after a long day. The natural magnesium and potassium components of sea salt help play a role in treating muscle cramps and fatigue, as well as aches and pain. This form of salt prevents toxins from accumulating and causing muscle tension. We all need help some days with dark circles and bags under our eyes. Use a sea salt compress to eliminate these symptoms and reduce puffiness. The benefits of a sea salt bath include a calming effect that may help you to unwind and release emotional tension as it relaxes your muscles. It also works to help lower the amount of saliva we produce, maintaining our hydration while we sleep. The anti-inflammatory properties of Dead Sea salt are also found to help people dealing with rheumatoid arthritis. A study conducted on rheumatoid arthritis patients divided into sea salt users and sodium chloride users found a significant improvement in mobility in lab results pertaining to the sea salt group. Sea salt may be able to help with the skin condition of psoriasis when used in conjunction with your prescribed medication. A study conducted in the Dead Sea itself using psoriasis patients and those with psoriatic arthritis found that their itchiness and scaling symptoms had lessened. Researchers also found that there was also an improvement with spine flexibility and reduced spinal pain for the psoriatic arthritis group. This study ended with balneotherapy, a combined treatment of sulfur baths, mud packs, and sea salt. This same form of treatment is also beneficial for those with osteoarthritis. Combat the inflammation of rhinosinusitis with the components of Dead Sea salt. It is a natural source to treat congestion and swelling from allergies, as well as poor nasal and respiratory conditions. Whether you are trying to prevent a high blood sugar count or are a diabetic trying to regulate your blood sugar, sea salt has been proven to help some patients. All salt comes from salt water, whether it’s from bodies of fresh water, or from former sea water pools in underground salt deposits. While sea salt is taken directly from the sea, regular table salt is the result of a process using additives. For some, there is a difference in the taste. Let’s take a closer look at sea salt vs. table salt. Both table salt and sea salt also contain iodine with extra added to the table salt production. Salt is salt and moderation is key, whatever form it comes in. The Dietary Guidelines for Americans has set a daily limit of less than 2,300 milligrams. Sea salt has received a lot of attention as being a healthy alternative to table salt. It has been used for centuries as a therapeutic source and has been the subject of many successful clinical studies. Sea salt has helped people with symptoms of skin conditions, allergies, asthma, and hair issues such as hair dandruff. 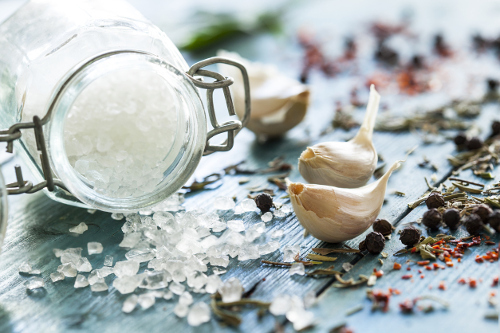 While it maintains natural trace minerals and elements through its unique processing, sea salt still needs to be used in small amounts. Too much of any salt can lead to serious health conditions such as high blood pressure. Zeratsky, K., “What’s the difference between sea salt and table salt?” Mayo Clinic, May 4, 2016; http://www.mayoclinic.org/healthy-lifestyle/nutrition-and-healthy-eating/expert-answers/sea-salt/faq-20058512, last accessed April 7, 2017. “19 Amazing Benefits of Sea Salt,” Organic Facts; https://www.organicfacts.net/health-benefits/other/health-benefits-of-sea-salt.html, last accessed April 7, 2017. Proksch, E., et al., “Bathing in a magnesium-rich Dead Sea salt solution improves skin barrier function, enhances skin hydration, and reduces inflammation in atopic dry skin,” International Journal of Dermatology, February 2, 2005; 44(2):151-157. doi: 10.1111/j.1365-4632.2005.02079.x, last accessed April 10, 2017. Sukenik, S., et al., “Dead Sea salt baths for the treatment of rheumatoid arthritis,” Clinical and Experimental Rheumatology, July 1990; 8(4):353-357. https://www.ncbi.nlm.nih.gov/pubmed/2397624, last accessed April 10, 2017. Sukenik, S., et al., “Treatment of psoriatic arthritis at the Dead Sea,” The Journal of Rheumatology, July 2004; 21(7):1305-1309. https://www.ncbi.nlm.nih.gov/pubmed/7966074, last accessed April 10, 2017.